"This sandwich is super easy to prepare - but yummy and just dressed up enough for a romantic dinner for two." 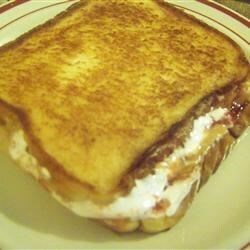 Stir together peanut butter, strawberry jelly, and marshmallow creme until just combined. Spread the peanut butter mixture on 2 slices of bread, and top with the remaining 2 bread slices. Melt the butter in a skillet over medium-high heat, and fry sandwiches, turning once, until golden brown on both sides, about 3 minutes per side. Remove from heat, cut in half, and serve. Share mugs of gooey PB & J! I couldn't finish it - too sweet. That's saying a lot considering I have a major sweet tooth. I love these... ALWAYS a hit with the kids! I leave out the marshmallow creme, though. Too sweet for me.